Bunion Treatment in San Antonio | Next Step Foot & Ankle Clinic , caused by your big toe displacing toward the smaller ones. As the bones lean inward, the metatarsal they are attached to leans outward. The joint where the two meet begins to bulge. This big toe bump gets bigger the more the bones slide out of alignment. The joint can also swell with friction and stress over time, enlarging the protrusion. The bones displace because of a structural weakness in the foot. Shoes often play a role in this—high heels and pointed toe boxes that squeeze the digits encourage the big toe to slide out of alignment. 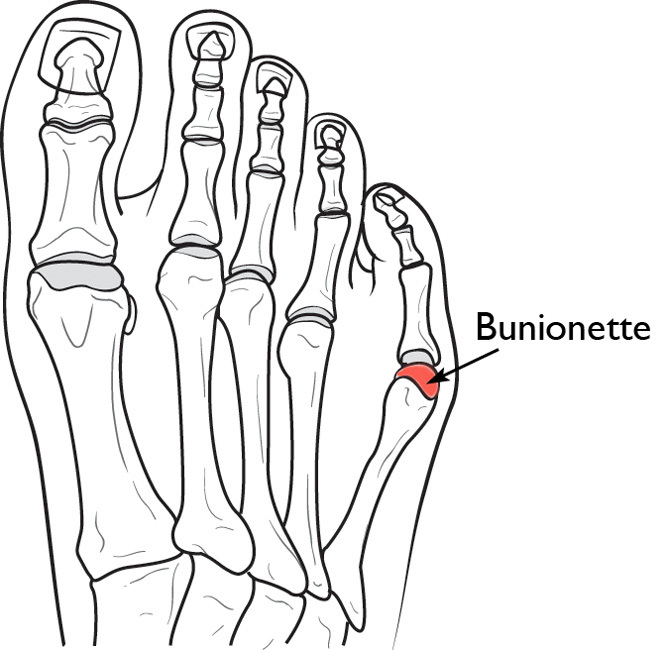 A Tailor's Bunion or Bunionette is the enlargement of the outside of the foot just behind the little toe. Behind each toe is a long bone in the foot. These bones are called metatarsals and numbered one through five with the fifth metatarsal being behind the little toe. The bunion frequently rubs painfully against footwear, making it uncomfortable to wear many shoes. As the condition progresses, the pressure from walking becomes uncomfortable as well. Friction against the bulge can lead to painful calluses. Conditions like hammertoes, bursitis, corns, and others may arise as complications. Symptoms from the bump can be treated quite successfully using conservative measures, but actually correcting the misaligned bones does require surgery. The sooner you begin to treat your bunions, the more likely that non-invasive remedies will eliminate your pain and allow you to continue your activities. Here at Next Step Foot & Ankle Clinic, we thoroughly evaluate your lower limbs and use diagnostic tests and images to determine the extent of your condition. Then we are able to work with you through various treatment options to reduce your discomfort and prevent progression of the problem. You’ll need to limit friction against the big toe bump and discourage further displacement. Most likely you’ll need to adjust your shoes to wider, more supportive models. Narrow, pointed, and high-heeled footwear all encourage the big toe to displace. They also rub against the bunion and aggravate it. Padding and tapping helps protect the bulge from rubbing while controlling the toe’s alignment. Gel or moleskin pads work particularly well. Physical therapy can help you retain your range of motion in the joint and strengthen your foot’s stabilizers, reducing strain on the ball of the foot. You may need orthotics to correct biomechanical problems and cushion the forefoot as well. If noninvasive therapies do not help and the problem progresses, you may need surgery to realign the toe and diminish the bulge. A bunion deformity has two components that need to be address. The first one is a large growth of bone, which can become painful, especially in closed shoes. The second component is a crooked big toe. At Next Step Foot & Ankle Clinic, our doctors are trained in minimally invasive bunion surgery. Minimally invasive surgery may involve making three or four small incisions. One or two incisions are used to file down the bump and to make a wedge in the bone. The wedge repositions it which helps prevent recurrence. Another incision is made over the toe to make it straighter. The last incision allows the surgeon to release soft tissue structures which have helped to pull the toe out of alignment. These incisions can be less than a half inch long due to the use of specialized instruments. The smaller incisions result in reduced damage to soft tissues, so there tends to be less pain, less swelling and minimal scarring. The procedures can be performed under local anesthetic and without leaving pins, screws or wires in the foot. Take a look at a minimally invasive bunion surgery. Left untreated, bunions will progress and can cause other problems such as hammertoes, corns on the toes, calluses on the soles, and ingrown nails. Do I need special shoes for bunions? What can I do to relieve bunion pain? Severe bunion deformity surgery results for B.B. Moderate bunion surgery results for A.G.
Bunion surgery results for E.S. Severe bunion deformity surgery results for M.T. You don’t have to accept the pain and unsightly appearance of bunions, or be afraid that surgery is your only option. Dr. Darren Silvester is an expert in conservative remedies for the feet and ankles. Contact Next Step Foot & Ankle Clinic in Pleasanton, TX, for an appointment or more information and take care of your feet. Call (830) 569-3338 or fill out the online contact form to reach us. Also, visit our Bunion FAQ page for answers to your questions.